This guide will help you get the most from your Tourme.ca premium virtual tours. On this page you will find helpful hints and detailed instructions on using the system, and making sure your tours get the right kind of response from potential home buyers. Tip: Check the ‘Remember me?’ box to save your username. 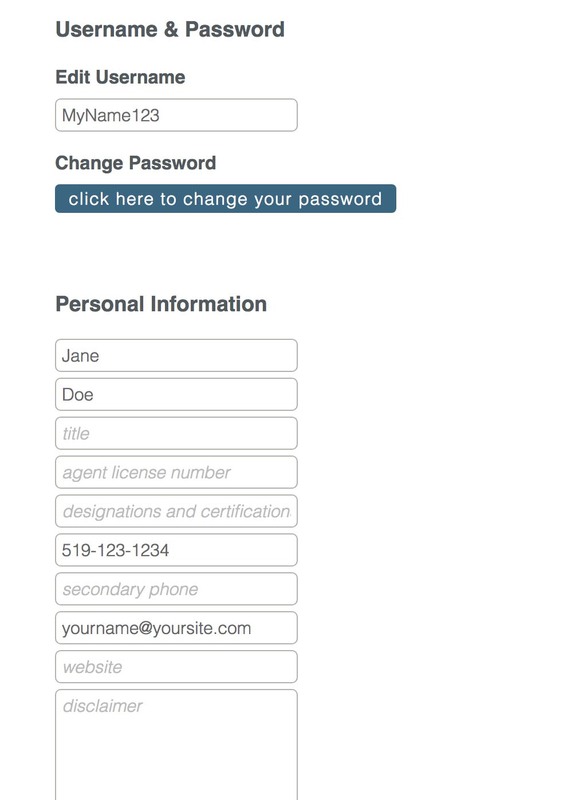 The form field will automatically have your username filled in the next time you log in. Once logged into your account, hover over “My Account” and click “Profile Settings”. Don’t forget to click the ‘save changes’ button at the bottom to save your changes. You can view one of your branded tours to see how the changes look. There is a one-time setup to connect your YouTube channel to your TourMe account, so that you can convert your tours to videos and have them automatically posted to your YouTube Channel. First, you will need a Google Account and YouTube Channel. If you don’t already have a Google Account and a YouTube channel, check out YouTube’s ‘Create A New Channel’ guide for help. Second, once you are logged in to your TourMe account, select ‘YouTube Setup’ from the ‘My Account’ dropdown menu. TourMe’s YouTube Setup page will guide you through the process of connecting your two accounts. If you run into any issues during this process, you can contact administration@tourme.ca. Now, every time you post a Virtual Tour Website link on Facebook (or other social media sites), your domain name will be visible alongside your tour content. By choosing to have your tours appear on a custom domain, you can create a richer branding experience for your clients, potential clients, and buyers, by driving traffic back to your primary website. TourMe provides you with 3 Heading Fields you can use to position your Listing to potential buyers and highlight key features. Heading 1 – Displays prominently at the top of the tour in the coloured bar. Examples: “Magnificent Diamond Lake Home”, “New Construction in Masonville Area”, “Totally Updated Home in Westmount”. Heading 2 – Displays just below heading 1, in slightly smaller font. Examples: “3 Bed / 2 Bath / 1540 Sq.Ft.”, “4 Bed / 3.5 Bath / 3400 Sq.Ft. / 2 Acres”, “3 Bed / 2.5 bath / 2650 Sq.Ft. / Walk or Bike to UWO”. Heading 3 – Only available in the new Fit design. Displays above the tour description. If there is no description, this heading will be hidden. Examples: “Just Listed”, “Open-House Sunday 2-4pm”, “New Price: $129,500”. Log into your Client Panel and select the relevant Tour from the list of all of your Tours. Click the ‘Edit Tour’ icon. Select the ‘Tour Info’ tab. 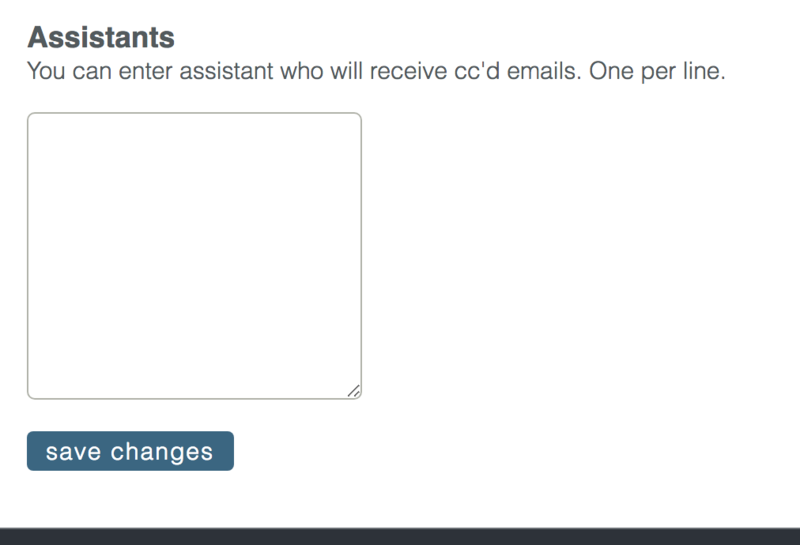 Now you can edit your headings by typing text into the fields shown. A note on branding: the heading fields will populate on the branded and unbranded versions of your tours, so be sure that you do not include branded information here in order to comply with the MLS policies. Your tour needs a description. You’re in luck! 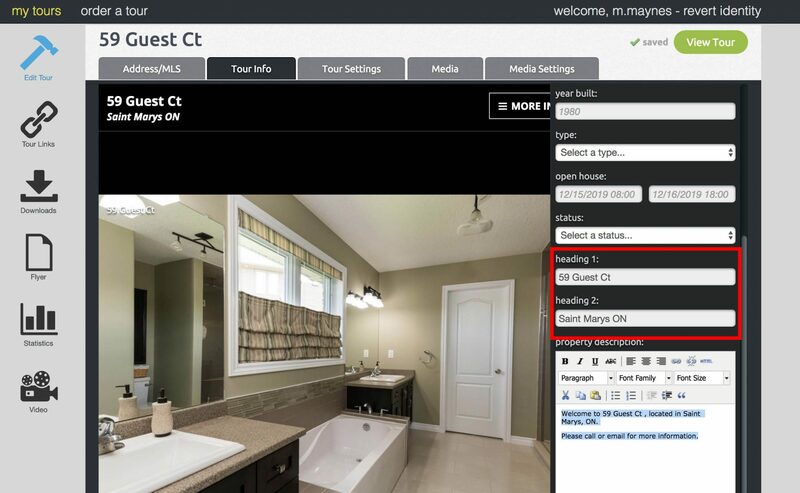 You can copy and paste the written description from your MLS listing right into your tour. Select the relevant Tour from the list of your Tours. Now you have access to the Property Description panel. There is ample room, so there’s no need to stick with ‘agent-speak’ or use abbreviations, and you’re free to add all the details you want to. 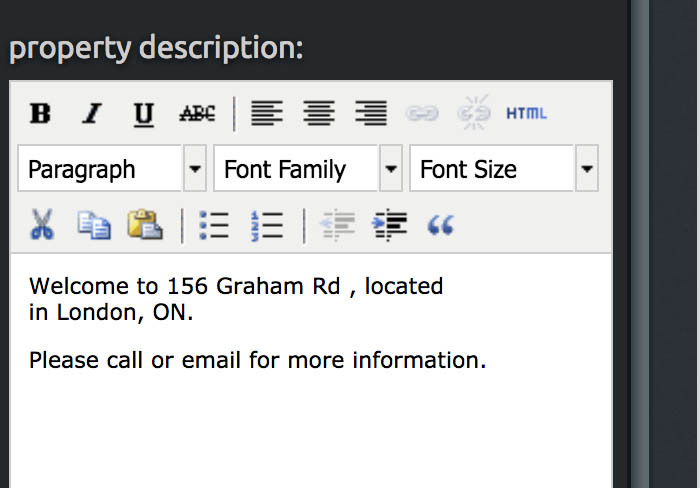 You can also format the Property Description field with the text editor: use bold, italics, change font size, add lists, add links to neighbourhood information, etc. The Property Description field will populate on the branded and unbranded versions of your Tours, so be sure that you DO NOT include branded information here in order to comply with the MLS policies. Your Tour will come ordered in a way to guide potential buyers through the home. However, if you want to change the order of the images, simply drag-and-drop the images to the desired order with your cursor. Select the relevant Tour from a list of all of your Tours. Select the Media tab simply drag-and-drop the images to the desired order with your cursor. Changes will be saved automatically; no need to hit a ‘save’ button! Select the tour to which you’d like to add photos or video. Click on the ‘Edit Tour’ icon. Click the ‘Select Files’ button to find files from your computer’s hard drive, or simply drag and drop files into the indicated area to upload them. These files can then be rearranged just as any other videos or photos, by clicking and dragging them into a new order. As always, the changes you make here will be saved automatically. Typically, Lemontree Inc. will provide photos of the whole home. If there is an image you don’t want shown in the Tour, you can easily remove it from the Virtual Tour Website. Select the relevant Tour from a list all of your Tours. Click on the image in question in the Media tab. A blue selection border will display. Now you can can remove the photo by checking “neither virtual tour nor gallery” in the options on the sidebar. TourMe gives you 60+ music tracks to choose from, so you can select the perfect tune to accompany your listing. If you prefer, you can also choose to turn the music off. First make sure the audio on your computer is enabled, that MUTE is turned off, and that any external speakers or headphones you are using are plugged in and turned on. Log into your Client Panel and select the relevant Tour from amongst all of your Tours. Click the Media Settings tab. You will now see music choices with a drop-down menu below it. Select [ No audio ] to turn the music off. To sample some of the 60+ available tracks, click on the track name, and wait for just a few seconds until the track starts playing. If you are happy with the selection, simply leave it selected. TourMe will automatically save your selection. 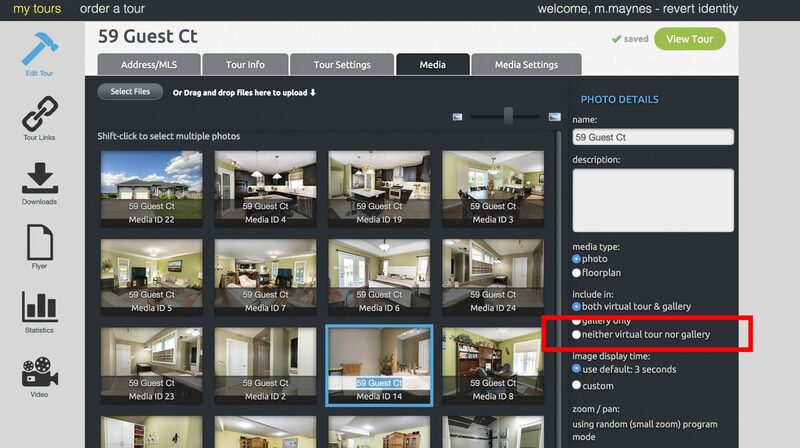 By default your Tour will display images for 3 seconds before automatically transitioning to the next image. However, some people prefer a slower-paced Tour. Here’s how you can adjust the speed of your Tour. Click on the Media Settings tab on the right-hand-side. 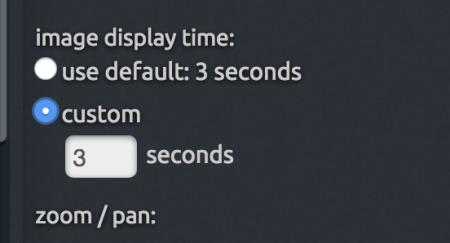 In the field on the sidebar, enter a custom value in seconds for how long you’d like each image to display. If you prefer a certain speed for every tour, just let us know and we’ll change your customer preferences so that all of your Tours are displayed at the pace you prefer. Tour speeds are also influenced by internet connection speeds and server traffic, so if your Tour seems slower at a particular time, this is usually an internet-related issue. MLS allows you to add your Unbranded Tour link to the video link fields in the MLS database for each listing. 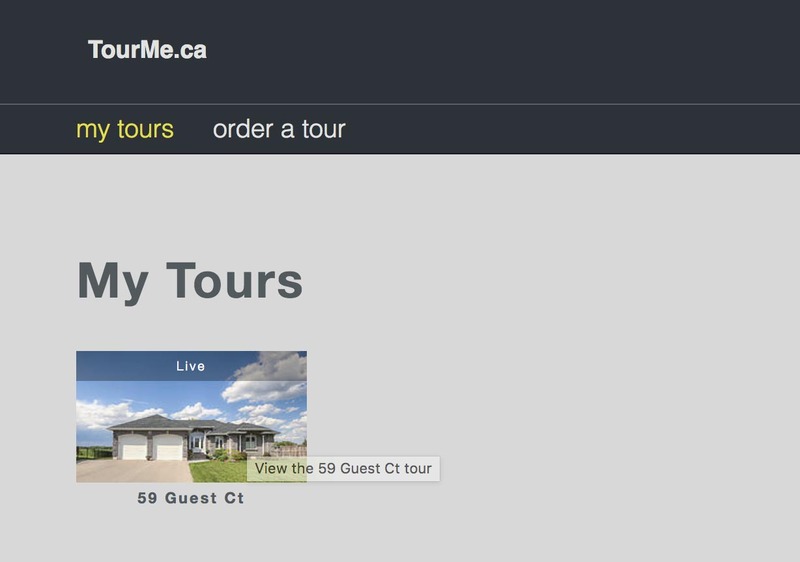 Copy & Paste the link to your Unbranded Tour from your Photo & Tour delivery email (see image below) into the appropriate field in the MLS database listing, on any listing website you may be using. How do I post my tour to YouTube? There are a couple options for getting your Tour posted to YouTube. When you book your photography with Lemontree Inc. ask us to export to YouTube for you. A $10.00 fee will be added to your invoice, and we’ll take care of exporting your Tour to YouTube when we deliver the photos. Follow the instructions on our YouTube guide to link your YouTube account to your tours with a one time setup. If you completed the YouTube Setup (as outlined in the link above), you will receive an email with a YouTube link to find your Video automatically posted to your YouTube Channel. Additionally, you will be provided with a link to download the video so it can be uploaded to other real estate listing websites. As soon as the Tour is on your YouTube Channel, you can edit video’s title and description if necessary. Tip: The effectiveness of your video in reaching a new audience will improve if your listing has a location feature that is more likely to be searched, for example, University of Western Ontario, Boler Mountain, Riverbend Golf Course, or Masonville Mall. You can list these location features in the description area of your Youtube video. Whereas your listing will drop off the MLS when you mark a house as sold, your tour remains online! Thankfully, you can deactivate your virtual tour website for properties that have sold. How do I deactivate a tour? When you deactivate a TourMe Tour, the tour is no longer available on the internet, but the photos and tour itself are kept on the TourMe server, and can be reactivated without charge, at any time. How Do I Re-activate my tour? If you have to list the home you sold again, you can resurrect your deactivated tour to the internet. Tours cannot be reactivated through your client panel. You will need to contact administration@tourme.ca to have your tour reactivated. Why should you should deactivate your tour website? Deactivating your tour ensures the privacy of the new owners of the home you listed. Most new home owners don’t think about this, but the inside of their home may be fully visible via the tour that you created to sell that home. This presents a potential security threat. Why would I want to leave my Sold tour active? You may need to keep your best listings in certain price brackets as active tours to showcase to potential clients as part of your portfolio. To get started, let us know if you've worked with us before. We need some information about you to continue. We need some information about the listing to continue. Scheduling is accomplished on a first come first serve basis. Use the tools below to request a spot. Please note we are closed on weekends, and observed holidays. Let us know your preference for scheduling. Let us know your preferred date for the photo/video session. Your preference of morning or afternoon on the date selected above? Choose the services you feel will benefit your listing most. Our photography service includes exterior and interior images of the home, delivered no later than noon the following business day. A photographer is scheduled for up to 1 hour MAX on location unless additional time is purchased and scheduled PRIOR to the session. Mandatory charge for homes valued over $1,000,000. Includes additional time spent on location resulting in additional images and post processing time. Additional images may be requested or necessary in order to capture everything needed for your marketing purposes. For example if the listing is close by a park, a trail or other amenity which you would like to be photographed, select this option. Our video products are priced to be affordable and scalable. Delivered within 1-2 business days. Includes additional time spent on location resulting in additional footage and post processing time. For an additional fee we can film surrounding parks, shops or even open fields to help give viewers an idea of what the neighbourhood is like. Aerial photos and footage can show the property from a different perspective, adding value and interest to your listing. We have multiple delivery options based on your marketing needs. If you are unsure which suits you better please click the help tooltip provided. Our basic in-house, unbranded delivery system provides a simple user interface to acquire your media, and an unbranded MLS compliant online gallery to add as a multimedia link on realtor.ca. Our premium delivery system is hosted by Tourbuzz.net. This system provides a password secured user interface in which you can update your information, branding and more. You also have complete control over your branded tours by organizing photos and selecting tour music as well as generate brochures which can be easily printed and handed out to prospective clients. Hitting "Submit" will send your order to our admin team. All fees are subject 13% HST.